One of the things I love the most in the Copenhagen is the numbers of old taverns. Some of them, as Hviids Vinstue and Skindbuksen are going back to the beginning of the 1700s. 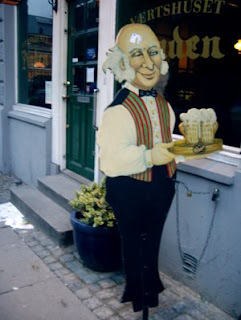 Here you may enjoy a fresh pint of beer and a shot of aquavit or a digestive. 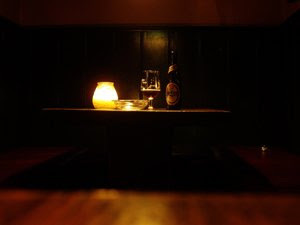 As Ketil and I landed, we were eager to discover more of the taverns Copenhagen has to offer, and believe me, were not disappointed. Ketil and I found this bar / cafe by chance. Classification wise is it more a tavern where you may eat out of a French or maybe Belgian menu. 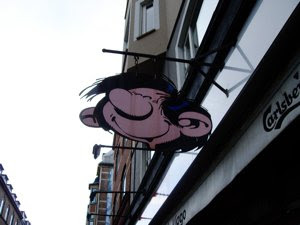 Let us face it, Viggo (Gaston Lagaffe) is a Belgian cartoon figure, or? Belgian or not, this was a seriously nice place to hang around. I could even use my French a little and try an innocent flirtation in the bar. We enjoyed a few good glasses here, as we visited twice. It was, after all, just around the corner to our hotel. I have to return to Hviids Vinstue. 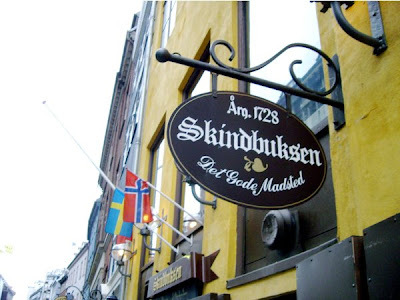 This tavern goes as far back as 1723, located by Kongens Nytorv, close to the historic district of Nyhavn. Last time I was here, there was no smoking ban in Denmark. Now there is a smoking ban, but there are some exceptions. If you have an area smaller than 38 square meters or 400 square feet, you may be exempt of the ban. 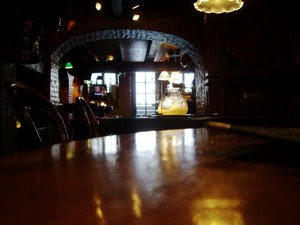 At Hviids they have glassed in a part of the tavern, where you may take a cigarette to your beer. Hviids Vinstue was as rustic as I remembered it, and it is a must if you want to experience a real Copenhagen kneipe. Whereas Hviids Vinstue is visited by many tourists, Værtshuset Pinden is the real thing. We felt slightly at odds, as Norwegian tourists, as this was the place for the locals. Thus Værtshuset Pinden was the most authentic bar we visited during our days in the Danish capital. This was one of the bars that still welcomed those of you that want to light up a cigarette or a cigar. The dark interior in brown and green, the red and white tablecloths, and a huge painting gave it an intimate and cozy atmosphere. If you want to see an authentic Danish kneipe, Værtshuset Pinden is it! Go in, buy a Carl and a Gammel Dansk Bitter and breathe in the atmosphere. In one of the ancient houses in the historic district of Nyhavn you find Skipperkroen. In Nyhavn you are in serious tourist trap country. People are captivated by the beauty of the old houses by the old docks. We went into Skipperkroen on Nyhavn, as a shower made us wet, as we had forgotten our umbrellas. We had a pint, and discovered that we were surrounded by fellow Norwegians, Swedes and German. Here there were a full smoking ban, and in spite of the interior, Skipperkroen lacked atmosphere. So unless you have forgotten your umbrella, I would have enjoyed my pint somewhere else. Another tavern in another tourist trap. Lurblæseren is a tavern located in the shopping area Strøget, close to Rådhuspladsen, the City Hall Square. 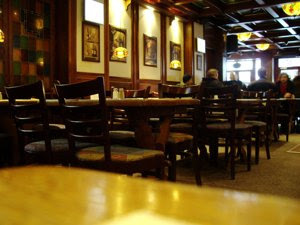 Here you may get traditional Danish food and a pint. The food is OK (I have eaten here before), and the beer is expensive. Here you pay 50 DKK for a pint, i.e. close to €7!! Is it worth it? No. Pass the square, go towards Copenhagen Railwaystation and find Værtshuset Pinden! !